Peter Bryer: Mobile Foresight: Damned truth and statistics. Is Google buying a major global smartphone vendor in Motorola Mobility? No. Damned truth and statistics. Is Google buying a major global smartphone vendor in Motorola Mobility? No. "Verticalization and integration. Distribution and production. Global reach and blah blah blah." I've been reading and listening to the opinions of many analysts and tech reporters about Google's planned takeover of Motorola Mobility. All mention the importance of Motorola's patent portfolio as part of Google's buying decision. Agreed. And most go on to talk about how Google will take this much further. "They will take tighter control of the Android ecosystem." "They will have vertical control like Apple has now." "They have purchased a major manufacturer of smartphones." I don't agree. 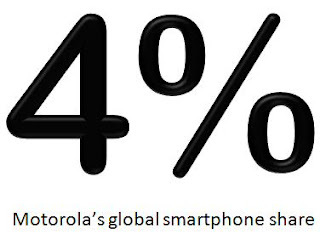 The stats and facts of what Motorola really is don't fully support this. Unfortunately for Motorola, this isn't 1995 any longer. The truth is, Motorola is no longer a major global player in much of anything. And for the most part, they don't "manufacture" anything either. (That's been outsourced to companies such as Foxconn.) For those who propose that Google is buying a big smartphone player with grand scale and great global reach, let's check the stats. MOTO's share of the global smartphone market is around 4%, most of that from sales in the U.S., Brazil, and China. Motorola is only the 8th global smartphone vendor, with both Huawei and ZTE breathing down MOTO's neck. Motorola's smartphone market share across Europe hovers around 1% (due to an intentional concentration on the part of Motorola), and Motorola's handset unit has been running on negative profit margins nearly every quarter over the past five years, meaning Google will be diluting their margins going forward if they really do plan a serious push into the hardware business, all things being equal. Diluting margins? That would be a bizarre strategy on the part of Google. Was Google really searching for a way to become a significant global smartphone vendor? If so, I think their luck has run out. This is what has puzzled me about the Google acquisition of MOTO. Beyond a bag of patents, what does Motorola actually have? I agree Michael. As you say, Google is a much stronger brand than Motorola. Looking at Interbrand's latest "Best Global Brands" report, Google is ranked in the top five. Motorola isn't even in the list. Google was after a big, fat bag of patents. After that, Google probably doesn't quite know what to do with all the assets. Smartphone phones, feature phones, set-top boxes. This will be intersting. Google Wallet. The cards are in it. Who invented the tablet?! Who invented oxygen?